A while ago, the late Edo period kinkô artist Tobari Tomihisa landed on my desk, that is in the form of a research request. So I was once again going through all the relevant sources and I captured the gist of his career in my 2012 published The Japanese toso-kinko Schools. Now I want to first forward what we know about this artist from the mentioned relevant sources and second, based on my recent research, to provide you with some possible scenarios that could explain what was really going on. So please sit back and follow me on another journey into the fascinating world of Japanese sword fittings from a broader, cultural point of view (as we did it here, here, and here). Student of the Gotô family, skilled, Kisôji (喜惣次), for some reason, he broke up with the Gotô and lived henceforth in Zôshigaya (雑司ヶ谷), later on however, he returned to Kyôbashi (京橋) [where the Gotô family lived], did the preparatory work for dragons and shishi lions [for the Gotô family] but also designed his own pieces, for example a kozuka that shows a morning glory winding around a bamboo pole that bears the haiku “Asagao ya – kurikara-ryû no – yasasugata” (蕣やくりから龍のやさ姿, “The morning gory, of the graceful figure of a kurikara-ryû winding around a sword”) on the back side. Before we continue, I want to introduce one of these morning glory kozuka. There are several going round, so he must have made a bunch of them and as even the Kinkô Tanki mentions this very interpretation, it must have been much celebrated amongst his customers. Side note: Tomihisa’s works are all top-notch, i.e. he was truly highly skilled. 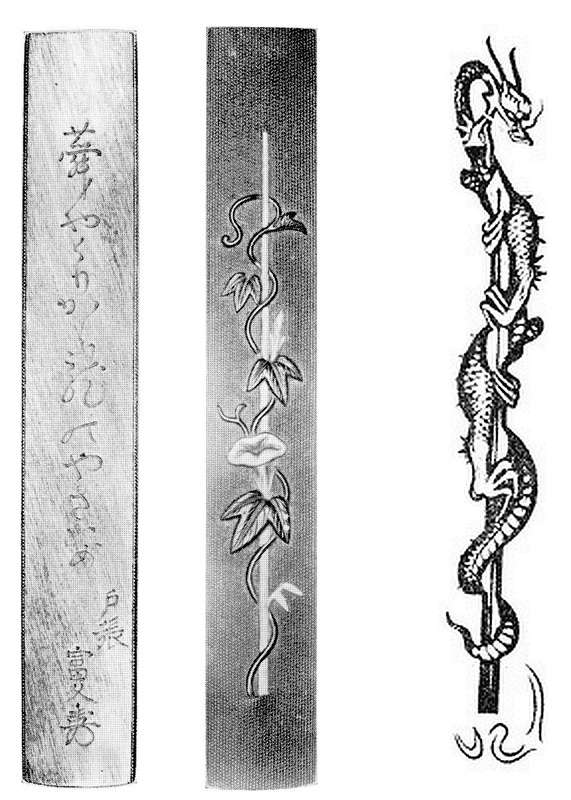 To the right of the kozuka, a kurikara-ryû engraving as we know if from swords, i.e. what came to Tomihisa’s mind when he looked at morning glories. On the other hand, a kurikara-ryû was an in-house kozuka motif of the Gotô School and maybe Tomihisa got his inspiration from preparing such pieces for the Gotô and thought to himself one day, let’s convert that into a morning glory. Anyway, the Kinkô Tanki does not mention his concrete master but it was the 13th Gotô generation Enjô (後藤延乗, 1721-1784), also named Mitsutaka (光孝). 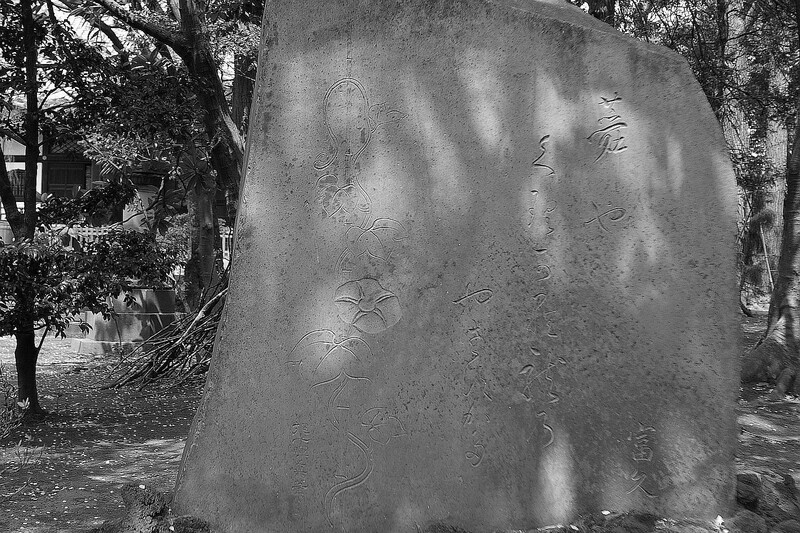 Now we know that Tomihisa died in Bunsei eight (文政, 1825), that is a considerable time after his master had passed away. We don’t know when he was born though but here is where my theories start, also incorporating the fact that we know of a very limited number of dated works, i.e. from Bunka six (文化, 1809), Bunka eight (1811), and Bunsei four (1821). When we assume that he lived to the age of 70 we arrive somewhere around Hôreki five (宝暦, 1755) for his year of birth. This would mean he was about 30 years old when his master Gotô Enjô died. And when we assume that he died at the age of 60, he was born somewhere around Meiwa two (明和, 1765) and was about 20 when Enjô died. Taking another lead from the relevant sources, that is that Tomihisa also ran a soba noodle restaurant, our journey continues. Digging into that soba matter I learned that Tomihisa did not just open a noodle restaurant because he “felt like to,” no, I found out that he was actually the fourth generation of a successful soba business that was located, get this, in Zôshigaya. From here, we have to take a detour to Edo period soba culture as it is in my opinion essential for the understanding of the whole career of Tomihisa. It is thought that soba noodles were introduced around the beginning of the Edo period and the first real soba shop or restaurant was opened, in Edo, during the Kanbun era (寛文, 1661-1673). Later on, Edo had everything from small and ultra-portable soba stands to large-scale restaurants that offered seating for many dozens of customers. Zôshigaya was a little special. The area started as a small village of the same name located about 3.5 miles to the northwest of downtown Edo. There was some much frequented temple and falconry grounds of the bakufu out there and after the Great Fire of Meireki had destroyed much of Edo in 1657, several bushi decided to rebuild their residences in the suburbs. As a result, the village of Zôshigaya gradually developed into an Edo outskirt and by the mid-1800s, it was officially acknowledged as a district (machi/chô, 町) of Edo. 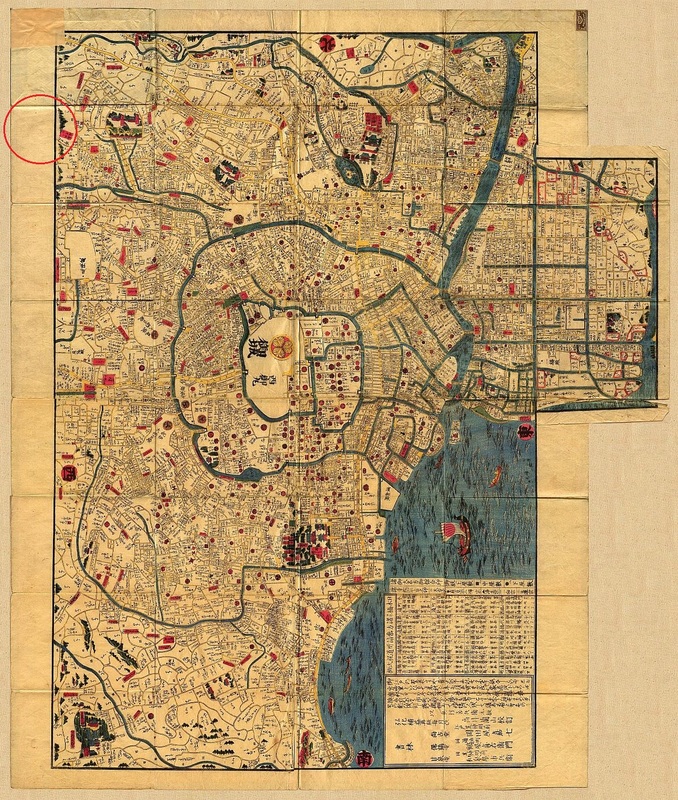 But it was still quite rural and woody and it even hardly made it onto the much later, the famous Kôka era (弘化, 1844-1848) map of Edo that is shown below (the circle marks Zôshigaya). Now we know how refined high Edo culture was and how sophisticated many of the higher-ranking bushi were. Like today, cuisine played an important role of daily life and it is no wonder that soon the Edo dandy’s were sharing “insider’s tips.” By the mid-1700s, Zôshigaya was home to several soba shops and as it was a woody area as mentioned, the term Yabu soba or Yabu no soba (藪蕎麦) was coined for their noodles which means “thicket soba” or “soba in the thicket.” And the dandy’s appreciated yabu soba as bring “real rural original” soba as it should be, not like the fast food they offer around downtown Edo. So this local Zôshigaya soba restaurants were quite popular. 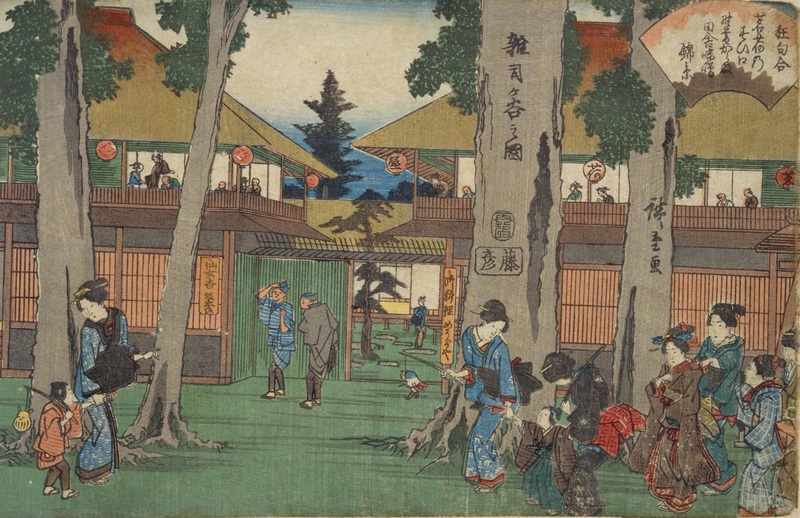 Below a print of a downtown Edo soba and udon shop as seen in the Ehon Sakaegusa (絵本三家栄種) from 1771. Miwataseba mugi no aoba ni yabu no soba, kori mo koko e Kisôji. If you look over you see the soba place in the thicket of fresh wheat, it is Kisôjis’, where even foxes and racoons stop by. And this brings us back to Tomihisa’s career. Renowned soba restaurants like that, or insider’s tips, were places with an endless coming and going of people from all walks of life, from the common servant to the high-ranking bakufu official. We know that Tomihisa became later a relatively well-known figure in the cultural circles of Edo, making acquaintance with several daimyô, and writing poetry himself under the pen names Shôseisai (松盛斎), Kôsôken (貢僧軒), and Senri (仙里), and some suggest that “Tomihisa” was actually one of his gô, what would mean that it should be read “Fuku.” He also became a friend of the famous Rinpa School painter Sakai Hôitsu (酒井抱一, 1761-1829). Incidentally, there is a memorial stone within the grounds of the Zôshigaya Hômyôji (法明) that bears the aforementioned asagao poem of Tomihisa, his name, and a morning glory as once painted by Hôitsu (see picture below). Now with that information, i.e. that the depiction of the morning glory on the memorial stone goes back to Hôitsu, and seeing striking similarities in interpretation, it is very likely that the morning glory on Tomihisa’s famous kozuka bases on a drawing or sketch that he received from his painter friend. 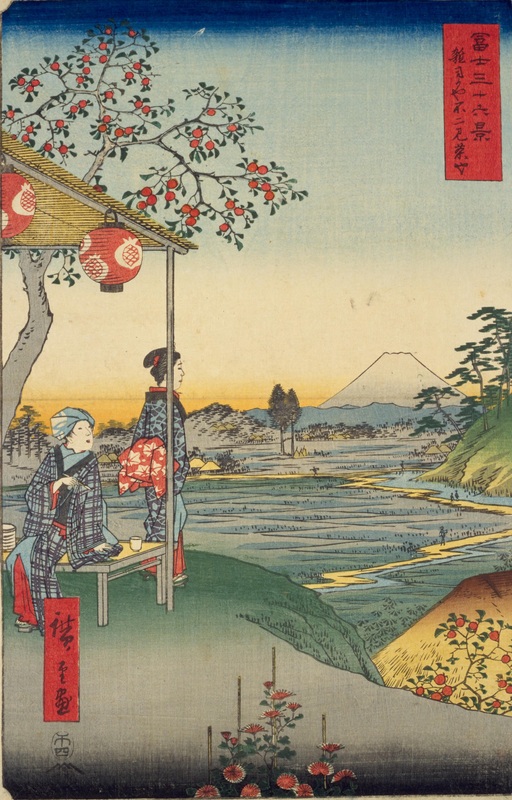 Below I want to present two ukiyoe prints by Utagawa Hiroshige (歌川広重, 1797-1858) where he features Zôshigaya. On the one hand as a reference, i.e. to show you the atmosphere of the then Zôshigaya neighborhood, but on the other also because the bottom one that has a view of Mt. Fuji shows at the very bottom, lo and behold, morning glories! So these flowers were around where Tomihisa ran his soba restaurant. With this in mind, I think that he was kind of inspired by them, maybe they reminded him of his time as an apprentice with the Gotô family (more on this in a little), i.e. preparing and handling kozuka with kurikara-ryû motifs, and so he combined all that, that is his inspiration, the fact that he was involved in the kinkô craft, and his poetry, asked then his friend Hôitsu for a sketch for a morning glory on a pole, and turned all that into a nice little kozuka series. But you have to understand, asking Hôitsu for a sketch does not mean that Tomihisa was incapable of drawing one himself. No, such collaborations were very common and a vehicle to honor all involved artists and craftsmen. Finding out all this, I will reconstruct Tomihisa’s career for the time being as follows: He was born into a family that run a successful soba place in Zôshigaya. I guess they have been well off, able to support their son’s passion for sword fittings and arranging an apprenticeship with the renowned Gotô family. But when his master Enjô died in 1784, Tomihisa was either around 20 or 30 by that time, he decided to return to Zôshigaya to take over his family business in fourth generation. Therefore I think there was no real “break” with the Gotô family, as for example Kuwahara Yôjirô (桑原羊次郎) suggests in his 1941 published Nihon Sôken Kinkô Shi (日本装剣金工史). Tomihisa just went back to his initial family business from where he was also able to cultivate and intensify his contacts with persons from culture, business, and government. Maybe somewhat later in his life he decided to once more focus on his passion of making fine sword fittings and so he returned to Kyôbashi. I guess that the Gotô gave him permission to work from their workshop as Tomihisa’s son, Yoshihisa (喜久), studied with the Gotô family too. However, we know that Yoshihisa later opened his own kinkô workshop in the Suidô-chô (水道町) neighborhood which is about halfway between Zôshigaya and downtown Edo. 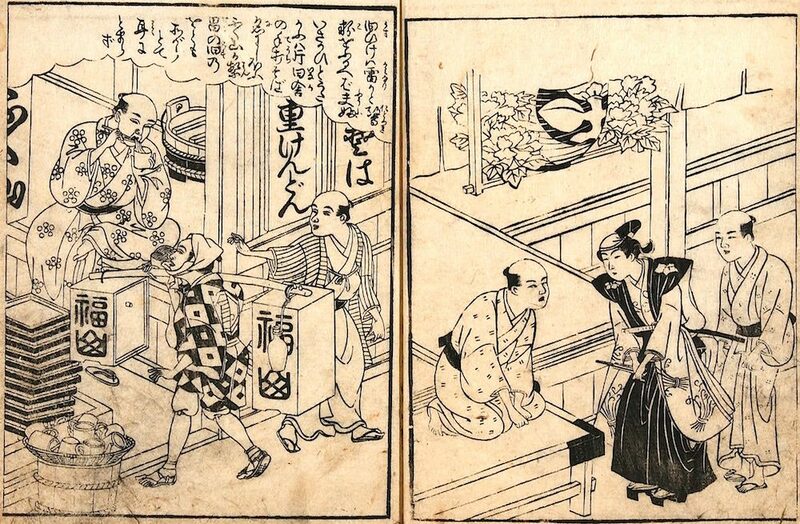 Also we know that the Kisôji soba shop went out of business at the end of the Bunsei era (文政, 1828-1830), what basically means to me shortly after Tomihisa died. Thus we might assume that facing the end of his career, Tomihisa shifted more towards the kinkô profession and had his son continue that rather than the soba family business (we know dated works of Yoshihisa from 1828 and 1841, so he surely did not give up the craft after only a few years when his father passed away). But many scenarios are possible, for example the one that other soba local restaurants gained “supremacy,” pushing the Tobari family out of business. Or maybe Tomihisa was just tired of running such a bustling place and wanted to focus on the quiet and solitary fields of poetry and craftsmanship. This is quite interesting, not at least because of your work and findings, but also because this might be something for myself to consider some day. Markus do you generally accept research jobs? Loved reading this article. Thank you kindly. Thanks Axel! Yes, I accept research jobs. Research has become my second key area by now.